We describe a simple immunoassay to measure the production of pro-inflammatory cytokines, such as IL-1 beta production, in patients presenting with autoinflammatory phenotypes. By activating cells in whole blood cultures with pathogen-associated molecular patterns, specifically with lipopolysaccharide, cytokine secretion can be conveniently evaluated in whole blood supernatants. Yang, B., Pham, T., Goldbach-Mansky, R., Gadina, M. Accurate and Simple Measurement of the Pro-inflammatory Cytokine IL-1β using a Whole Blood Stimulation Assay. J. Vis. Exp. (49), e2662, doi:10.3791/2662 (2011). Inflammatory processes resulting from the secretion of soluble mediators by immune cells, lead to various manifestations in skin, joints and other tissues as well as altered cytokine homeostasis. The innate immune system plays a crucial role in recognizing pathogens and other endogenous danger stimuli. One of the major cytokines released by innate immune cells is Interleukin (IL)-1. Therefore, we utilize a whole blood stimulation assay in order to measure the secretion of inflammatory cytokines and specifically of the pro-inflammatory cytokine IL-1β 1, 2, 3. Patients with genetic dysfunctions of the innate immune system causing autoinflammatory syndromes show an exaggerated release of mature IL-1β upon stimulation with LPS alone. In order to evaluate the innate immune component of patients who present with inflammatory-associated pathologies, we use a specific immunoassay to detect cellular immune responses to pathogen-associated molecular patterns (PAMPs), such as the gram-negative bacterial endotoxin, lipopolysaccharide (LPS). These PAMPs are recognized by pathogen recognition receptors (PRRs), which are found on the cells of the innate immune system 4, 5, 6, 7. A primary signal, LPS, in conjunction with a secondary signal, ATP, is necessary for the activation of the inflammasome, a multiprotein complex that processes pro-IL-1β to its mature, bioactive form 4, 5, 6, 8, 9, 10. The whole blood assay requires minimal sample manipulation to assess cytokine production when compared to other methods that require labor intensive isolation and culturing of specific cell populations. This method differs from other whole blood stimulation assays; rather than diluting samples with a ratio of RPMI media, we perform a white blood cell count directly from diluted whole blood and therefore, stimulate a known number of white blood cells in culture 2. The results of this particular whole blood assay demonstrate a novel technique useful in elucidating patient cohorts presenting with autoinflammatory pathophysiologies. Obtain a minimum of 10 mL of peripheral blood from affected individuals as well as age and gender matched healthy controls. Venous blood should be collected into sodium heparin vacutainer blood collection tubes, rather than using other anticoagulants such as EDTA, and inverted several times to ensure proper mixture with the sodium heparin. Note that 10 mL is the minimum volume of whole blood required for plating samples in duplicate for this particular assay. Samples should be processed as soon as possible after collection for best results. However, heparinized blood can be stored at room temperature under dim lighting for up to 24 hours until ready to be processed (2). Once plasma is collected, wash samples by resuspending the red blood cell (RBC) pellet and buffy coat with serum free (incomplete) RPMI 1640 media (at ambient temperature). Gently pipette the mixture in the collection tubes and transfer to a 50 mL conical tube. Volume up to 50 mL with incomplete RPMI 1640 culture media and gently invert the tubes to create a homogenous mixture. Centrifuge samples at 3000 rpm (with brake turned off) for ten minutes. Making sure there is clear separation, aspirate the supernatant, being careful not to disturb the buffy coat. Repeat this procedure 2-4 times to ensure that all contaminants and bound cytokines are removed prior to stimulation. After the last wash, resuspend the RBC pellet and buffy coat so that the total volume is 20 mL (for 10 mL of whole blood initially drawn) with incomplete RPMI 1640 media. The total volume can be adjusted based on the volume of blood initially drawn. Using the Cellometer Vision, diluted blood can be counted without lysing RBCs by choosing the white blood cell count option using acridine orange (AO). Add one part diluted blood with one part AO and load 20 μL of the 1:1 mixture into a disposable counting chamber. The final concentration of AO after dilution should be 1μg/mL. Adjust accordingly with incomplete RPMI 1640 media to a final cell concentration of 2.0 x 106 cells/mL. The assay requires a minimum of four conditions (each done in duplicate): unstimulated, addition of LPS alone, addition of ATP alone, and finally LPS plus ATP added together. Add 1 mL of the prepared 2.0 x 106 cells/mL diluted whole blood into the appropriate well of a 24-well tissue culture plate. The stimulants should be reconstituted and brought up to room temperature before beginning the stimulation assay. Lyophilized LPS and ATP should be reconstituted according to the manufacturer's instructions. Following reconstitution, LPS and ATP can be further diluted to a proper stock concentration using incomplete RPMI 1640 media. Add LPS to the LPS only as well as to the LPS plus ATP well so that the final working concentration of LPS is 1 μg/mL. The total stimulation time is 3 hours. However, whole blood is stimulated with LPS for 2 hours and 40 minutes. Samples should be placed in an incubator at 37°C and 5% CO2. ATP is added during the remaining 20 minutes of the 3 hours stimulation period. Add ATP to the ATP alone and the LPS and ATP well and place samples in incubator. The final working concentration of ATP is 2mM. After the 3 hours incubation period, collect supernatants by aliquoting each sample into a 1.5 mL microcentrifuge tube and subsequently centrifuging samples at 10000 rpm for 2 minutes at room temperature. Transfer the supernatants to another set of 1.5 microcentrifuge tubes. Samples can be immediately assayed or stored temporarily at -20°C or -80°C for long-term storage. Samples that are frozen need to equilibrate to room temperature before analysis. Cytokine concentrations for IL-1βcan be assessed using a variety of methods. We utilize the Bio-plex Pro human cytokine x-plex assay with the Bio-Plex 200 system, per manufacturer's instructions. In this protocol we are specifically measuring IL-1β; however, we utilize this multiplex cytokine assay in order to simultaneously measure multiple cytokines in one assay with the benefit of using a small sample volume. 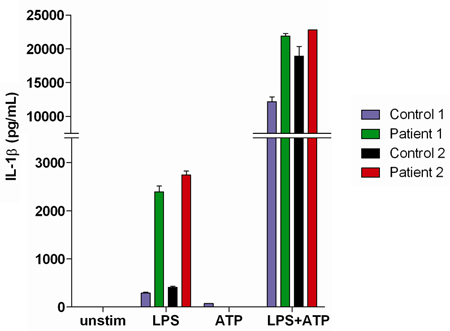 Analysis of IL-1β production upon successful stimulation with LPS and ATP shows a dose response dependent on the number of cells being stimulated. We have found that 2.0 x 106 cells/mL is a sufficient concentration to produce an optimal and measurable concentration of IL-1β as well as other cytokines (Figure 2). Whole blood assays are useful in studying patients that present with autoinflammatory manifestations. These patients may show a defect in the innate immune system, which can be characterized by overproduction of IL-1β (when compared to controls) upon stimulation with LPS alone (Figure 3). Figure 1. 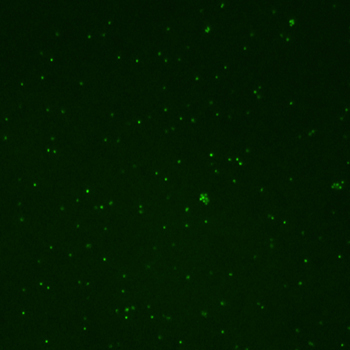 Representative image of AO staining for nucleated white blood cells used in order to determine cell concentration in diluted whole blood samples. Figure 2. IL-1β production measured in whole blood supernatants from a healthy donor upon stimulation with LPS at increasing cell concentrations. Samples were assayed in triplicate. Figure 3. Representative results of IL-1β secretion measured in whole blood supernatants from two healthy normal controls as well as two patients presenting with IL-1β-associated autoinflammatory manifestations. The whole blood assay described is a simple method that more closely mimics physiological conditions when compared to other techniques that would require cell isolation and extensive sample processing and manipulation. This method utilizes the Cellometer Vision with AO to count white blood cells in whole blood and therefore, provides a way to accurately standardize samples based on cell numbers. It has to be noted that for this assay, whole blood should be drawn into sodium heparin collection tubes as other anticoagulants are known calcium chelators and can thus affect the results of the assay. Serum free media should also be used because this may affect cytokine concentrations. Also crucial is the immediate processing of samples once obtained. 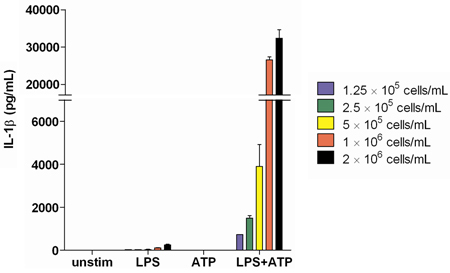 While the method described uses LPS and ATP to stimulate whole blood and measures IL-1βconcentration, other pathogens and stimuli can be used to measure various cytokine and chemokine responses upon stimulation; however, stimulation times and conditions may need to be adjusted accordingly. Finally, constant freeze-thaw cycles may affect cytokine concentrations. The detection of IL-1β utilizing the whole blood stimulation assay described provides an alternative to other methods and is an effective immunoassay to study diseases with inflammatory-associated pathologies. This research was supported by the Intramural Research Program of the National Institute of Arthritis and Musculoskeletal and Skin Diseases of the National Institutes of Health. Martinon, F., Mayor, A., Tschopp, J. The inflammasomes: guardians of the body. Annu Rev Immunol. 27, 229-265 (2009). Thurm, C. W., Halsey, J. F. Measurement of cytokine production using whole blood. Curr Protoc Immunol. 66, 7-18 Forthcoming. Mariathasan, S. Cryopyrin activates the inflammasome in response to toxins and ATP. Nature. 440, 228-232 (2006). Gabay, C., Lamacchia, C., Palmer, G. IL-1 pathways in inflammation and human diseases. Nat Rev Rheumatol. 4, 232-241 (2010). Franchi, L., Elgenbrod, T., Muñoz-Planillo, R., Nuñez, G. The inflammasome: a caspase-1-activation platform that regulates immune responses and disease pathogenesis. Nat Immunol. 3, 241-247 (2009). Sims, J. E., Smith, D. E. The IL-1 family: regulators of immunity. Nat Rev Immunol. 2, 89-102 (2010). Haug, R., Joø, G. B., Westvik, A. B., Kierulf, P. Chemokine production and pattern recognition receptor (PRR) expression in whole blood stimulated with pathogen-associated molecular patterns (PAMPs. Cytokine. 32, 304-315 (2005). Netea, M. G. Differential requirement for the activation of the inflammasome for processing and release of IL-1bin monocytes and macrophages. Blood. 113, 2324-2335 (2009). Latz, E. The inflammasomes: mechanisms of activation and function. Curr Opin Immnol. 22, 28-33 (2010). Masters, S. L., Simon, A., Aksentijevich, I., Kastner, D. L. Horror autoinflammaticus: the molecular pathophysiology of autoinflammtory disease. Annu Rev Immunol. 27, 621-668 (2009). Removing the plasma is critical because you want to remove all the soluble cytokines that have been previously released from the cells. This allows for a baseline reading without all the background noise. That is why we initially remove the plasma, then do a few rounds of washing with PBS without magnesium or calcium. EDTA is a very potent and irreversible chelating agent of calcium which will interfere with the ionic cellular matrix when trying to experimentally study the in vitro effects of LPS and ATP signaling in whole blood. That is the reason we used heparin as the anti-coagulant in our assay. Hope this helps. Best of luck in your experiments!